His second was more typical as he showed excellent pace to keep up his side’s counter-attack and coolly finished low past the goalkeeper. 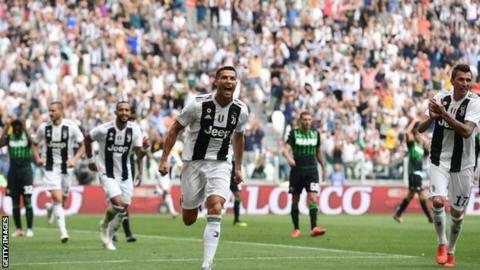 The crowd celebrated Ronaldo’s first goals for the club wildly, while the forward’s girlfriend and son were also in the stands to witness the moment. “I was a little bit anxious as expectations were high,” said Ronaldo. “I really wanted to score, so I’m happy. “Of course, there was attention after my arrival in Turin, but life is like that.